Among the oldest bedrocks in Minnesota, the rock outcropping at Jeffers was a part of a formation that underlaid an area that stretched from the southeast corner of modern-day South Dakota to New Ulm, Minnesota. At some distant point in the past the formation eroded into three pieces. This hard Sioux quartzite outcropping is part of a ridge about twenty-three miles long, 800 feet wide and rises 100 to 300 feet above nearby fields. Although separated now into three huge fragments, the rock formation at Jeffers formed 1.6 billion years ago as the same formation of rock found at Pipestone where Native Americans mined soft red stone to make sacred pipes. 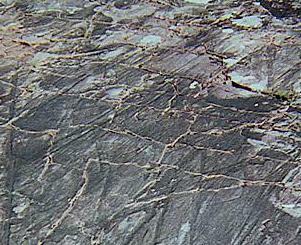 Pipestone is found between layers of quartzite. First laid down as a sand and mud deposit (as long ago as 1.76 billion years ago), this quartzite is a metamorphic rock formed from sandstone by heat and pressure deep in the earth about 1.6 billion years ago. The sand and mud were once apart of an estuary-beach environment much like the modern-day Florida Everglades. The estuary-beach environment was at the edge of a shallow (less than 300 feet), shifting sea that covered thousands of square miles. The ripples from this beach environment can still be seen in the rock.. Over and over rivers carried sand from land formations to the sea forming an alluvial fan or delta like formation. This delta formed ribbons of braided rivers that periodically flooded depositing silt on top of sandbars. Also, the sea advanced and then retreated, each time depositing sand silt, and organic materials. This activity lasted for 150 million years. The quartzite formation was covered by later formations whose great weight supplied the pressure and heat needed to first turn it to sandstone then to quartzite. After being cover by succeeded layers of rock through the ages, it was exposed again by the wearing action of time. Water, ice, wind and the roots of plants are agents that weather rocks. Flowing water patiently wears rock as it moves toward a sea. Freezing water expands in cracks to break up rock. Plants are mighty engines of destruction. They take root in the soil that settles in the cracks in rocks. Then as they grow, the roots expand with much force to break the rocks. Wind blown particles slowly grind the rocks. Some recent evidence of the grinding action of ice is seen in the deep striations, scratches left by glaciers when they pushed their way south 14,000 to 16,000 years ago.